STOP HS2 | Campaigners Shocked as HS2 Chief Engineer reveals ‘new city’ secret agenda. Andrew McNaughton opens his gob and puts his foot in it again. Whilst the current plan for 18 trains per hour on HS2 relies on technology which has not yet been invented McNaughton stated that he hoped 30 trains could be run. None of these issues were mentioned in the public consultation on HS2, neither was his assertion HS2 could be increased from 2 to 4 tracks 14km either side of intermediate stations like the one near Birmingham Airport. This could mean the doubling of track width from Kenilworth to Middleton. 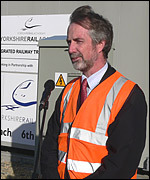 Another issue which has recently come up is the chance of HS2 running freight at night which is to be considered in a programme of ‘community fora’ organised by HS2 Ltd which start today (Monday 19th March 2012). This is despite McNauhgton previously asserting that “Freight will never run on my railway”. Pingback: STOP HS2 | Derby and Nottingham have to wake up to ‘new city’ threat. the reason for duplicating the infrastructure is that the current routes are now or will soon be overcrowded and the routes in question are between the places people want and need to travel to i.e. our major cities such as Sheffield Leeds manchester Birmingham London etc. what you say isnt very logical. are you saying that we should build new infrastructure between places where it isnt needed where the population centers are smaller such as say newcastle and middlesborough ? i really dont understand your point. especially since a common criticism of hs2 on this site is that it wont have enough passengers ! well if it didnt somewhere with less population certainly wouldnt ! and what is the difference between building near newcastle or between birmingham and coventry ? it might still be on greenfield site mightn’t it ? or maybe the key is that it wouldnt be near you anymore !!! stop hs2 wants to criticise hs2 about worries that it wont meet its passenger numbers at the same time criticising hs2 as in this case for maybe generating wider economic benefits something that has been denied before. or the euston station situation. even the much vaunted rp2, which funnily enough only benefits the people living in legendary 51 opposing council areas, will need more capacity at euston. the hs2 euston plan is slated for being too big for passenger numbers but simultaneously will lead to massive congestion on the london underground network according to critics ! not very consistent ! One would expect nothing less from STOPHS2 than trying to paint the blackest picture possible but I have to admit that the confection above is outstanding in its fanciful attempt to whip up a storm of controversy from the relatively benign ingredients provided by the public utterings of Professor McNaughton. Of course there will be considerable commercial development in and around new stations planned for the High Speed Line – even STOPHS2 has admitted that “everyone wants a station [nearby] but no one wants the line” – this might be something to do with jobs (as in new ones provided in areas of relative scarcity of this valuable commodity). This prediction merely provides more compelling evidence about the huge positive economic impact flowing from construction of the new line. I do like the manner in which your campaign is now shamelessly attempting to stoke public hostility in areas that may or may not be adjacent to phase 2, even before the preferred route is in the public domain. It is common knowledge that a Manchester South hub station will be located within the environs of Manchester Airport. If we accept the blatantly manufactured claim of “minimal mitigation” at face value this would mean the line travelling on or above ground level. Perhaps STOPHS2 can explain how is it proposed to by-pass the not insubstantial physical obstacle presented by the runways at Manchester Airport without a subterranean pathway – will they install some traffic lights on the line and expect approaching aircraft to circle round waiting for a train free spot to land? Ludicrous yes and that more or less characterises the narrative in the article above!!! A report out today suggests that the fastest growing parts of the economy geographically are the poor regions in the North-East and along the East coast, not the Midlands and North-West. So instead of investing in new infrastructure which could boost those developing areas, we are seeing a project that duplicates existing infrastructure and an economic case based on growth where it isn’t happening! Then we see Cameron mulling over the idea of doing to the road network what Thatcher did to the trains! This government cannot be trusted. They’ve done some good, but the evil outweighs it. I am so glad that I live in a democracy and that my views count.